Are you constantly fighting to find balance to oily skin and congestion? We hand-picked this natural and organic routine to help support skin that is oily, congested, dehydrated, reactive, hyperpigmented and blemish-prone skin. We have combined steps to increase efficiency and efficacy although each step may be done on its own is desired. Step 1 & 2 Cleanse and Prep: Combine one pump of the Stone Crop Cleansing Oil with a quarter sized shake of the Stone Crop Oxygenating Fizzofoliant and a couple drops of water. Mix together between the palm of your hands. Massage gently into your face for 60 seconds. Rinse with luke warm water. The Stone Crop Cleansing Oil is a lightweight oil that detoxifies, removes impurities, balances oil production and restores moisture balance. Key ingredients include stone crop which is found in many Eminence products. Stone crop is anti-inflammatory, regenerative and hydrating. Jojoba and sunflower oil cleanse and protect the skin. Potent swiss cress sprouts activates detoxification enzymes in the skin cells to protect the cells from the effects of pollution. Your skin is perfectly cleanses, surface buildup is removed and your complexion will appear clear, smooth and bright. The Stone Crop Oxygentating Fizzofoliant. is a rice based powder that detoxifies, oxygenates, de-congests and softens the skin. Similar to the stone crop cleansing oil, stone crop aids in cell regeneration while swiss sprouts work to de-congest the skin. Rice flour and adzuki powder gently exfoliates and buffs the the skin to rejuvenate and purify. Step 3 & 4 Exfoliate and Detoxify: Wet the skin with water and apply the Lilfox Jungleglow Rainforest Honey Enzyme Cleanser + Mask. 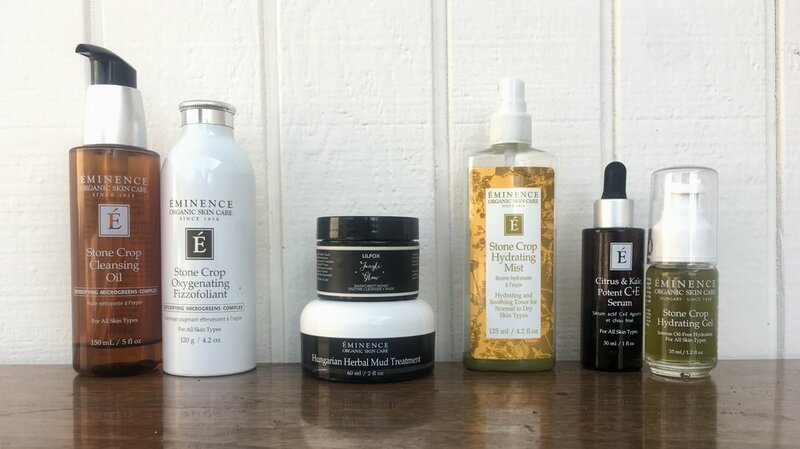 Immediately layer the Eminence Organics Hungarian Herbal Mud Treatment. (*note: this masque is SPICY and it is completely normal to experience flushed skin for up to 45 minutes after the treatment). Leave on for 10-15 minutes. For a gentle, manual exfoliation, massage before rinsing. Rinse with cool water. This treatment can be done 1-2 times a week. Raw honey hydrates and plumps the skin in the Jungleglow Honey Enzyme Mask. Rich in healing enzymes and antimicrobial to cleanse and prevent future skin issues. Cacao increases blood flow and promotes healing on a cellular level while Maracuja Seed Oil (Passionfruit) balances even the most hormonally-imbalanced and reactive skin types. The Hungarian Herbal Mud masque detoxifies the skin while eliminating toxins and increasing circulation. It includes cinnamon to fight off bacteria, ivy for vitamin C, sage to tone and heal, and paprika to stimulate and refresh skin. Step 5 Tone and Balance: Spritz your clean skin with the Stone Crop Hydrating Mist, or apply toner with cotton rounds. The Stone Crop Hydrating mist soothes and balances the skin. Stone crop hydrates and revitalizes while bearberry brightens your complextion. Step 6 Treat and Protect: Apply 2-3 drops of the Citrus and Kale Potent C + E Serum directly to the skin while the toner is still slightly damp on the skin to increase product penetration. Massage in until absorbed. The Citrus and Kale Potent C+E Serum is a Lightweight serum that reduces free radical damage by 47% in 3 hours using: stabilized vitamin c, vitamin e from avocado,botanical ferulic and hyaluronic acid, citrus fruit oils and leafy greens. These active ingredients boost collagen formation while reducing redness and inflammation. This serum protects the skin from further oxidative damage. Step 7 Final Hydration: Apply a thin layer of the Stone Crop Hydrating Gel over the entire face and neck area. Leave on. For a lighter application, emulsify a small amount of moisturizer in your hand with a few drops of water. For extra hydration, apply a thicker layer on dry areas. The Stone Crop Hydrating Gel is an oil-free moisturizer. Stone crop saves the day again by hydrating and revitalizing the skin. Green tea provides polyphenols and antioxidants to protect skin cells and pectin enriches and nourishes the skin. Skin in left soft and mattifies while visible signs of aging are reduce. Learn exactly how to use each product and Watch our Esthetician go through each step!